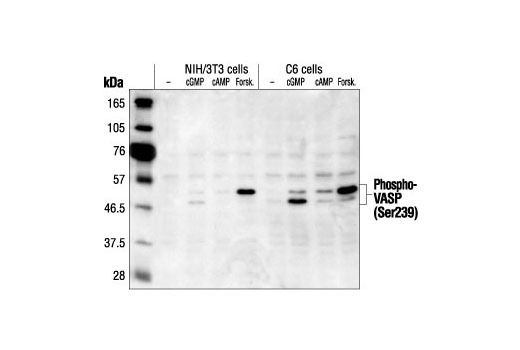 Western blot analysis of extracts from NIH/3T3 and C6 cells, untreated, 8-Br-cGMP-treated, 8-Br-cAMP-treated or forskolin-treated as indicated, using Phospho-VASP (Ser239) Antibody. Western blot analysis of extracts from A-431 cells, untreated (-) or treated with Forskolin #3828 (+), using Phospho-VASP (Ser239) Antibody (upper) and VASP (9A2) Rabbit mAb #3132 (lower). 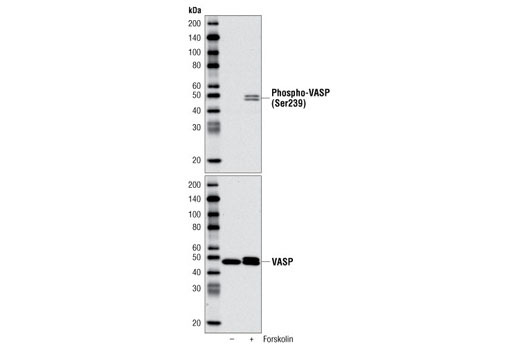 Phospho-VASP (Ser239) Antibody detects endogenous levels of VASP only when phosphorylated at serine 239. The antibody does not cross-react with phosphorylated VASP homologues, such as Mena. Polyclonal antibodies are produced by immunizing animals with a synthetic phosphopeptide corresponding to residues surrounding Ser239 of human VASP. Antibodies are purified by protein A and peptide affinity chromatography. Ball, L.J. et al. (2000) EMBO J 19, 4903-14. Machesky, L.M. (2000) Cell 101, 685-8. Smolenski, A. et al. (1998) J Biol Chem 273, 20029-35.